Having the right wine glass is not just about being a wine connoisseur snob, it's actually got a lot to do with the wine and its flavours and aroma. 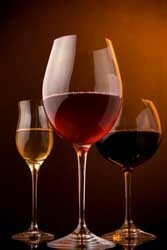 While there are many variations of wine glasses, three are most commonly used. These are: red wine glasses, white wine glasses and champagne flutes. All wine glasses consist of a stem and a bowl, which may differ in size. Generally, when drinking wine, it is advised that you hold the glass by the stem, so as not to affect or interfere with the temperature of the wine. The stem also allows you to swirl the wine with ease. Wine connoisseurs believe that the shape of the glass bowl is very important as it concentrates the flavour and aroma of the wine. Burgundy Glass – This has a slightly larger bowl than the Bordeaux Glass in order to accumulate the aromas of the more delicate wines such as Pinot Noir. Glasses which are used for drinking white wines usually have a narrower bowl than red wine glasses. This allows the temperature to remain more chilled as there is less air circulating around the glass. Champagne flutes or glasses can be easily identified by their long stem and narrower, taller bowl than a white wine glass. The design of the glass is said to retain the carbonated drink as the glass allows it to dissipate faster than any other wine glass.